Not since the irreverent Garfield has there been a cat so popular and well loved than the feminine and sweet Hello Kitty! This cute and purr-ty kitty now protects the floor of your car by allowing her likeness to appear on rubber floor mats, keeping those floors clean and adding a touch of personality to your car. The three Hello Kitty Floor mats that are in this review, are all manufactured by Plasticolor. Plasticolor have been supplying high quality products for the after care market for a number of years, including splash guards, air fresheners, license plate holders, and of course floor mats. The Hello Kitty floor mats are just three fine examples of the products produced by this company. The Hello Kitty Sanrio waving front and rear floor mats offer complete protection for the floor of your car, truck or SUV. This is a cute floor mat that will add a bit of color and fun to your car. These mats are ideal for teenagers and even adults who love this adorable fictional cat. There are less than a dozen reviews that could be found for the Hello Kitty waving floor mat set. However, out of the small number of reviews available on Amazon, these floor mats score almost maximum star ratings, which is extremely impressive. The one thing that was mentioned, as a negative, is that one customer felt that these floor mats could stay in place a little better. Overall, from the few customer reviews that could be found, it looks as though this waving Hello kitty floor mat set is well made and attractive, and sure to add a bright touch to the interior of your auto. The Officially Licensed Hello Kitty floor mats set of 2 are ideal for protecting your cars floor, by adding not only color, but a bit of whimsical personality as well. These Hello Kitty floor mats are extremely colorful, and Hello Kitty herself looks fluffy enough to cuddle. These floor mats are colourful, and enough to make you smile every time you set foot into your car. Reviews for these Hello Kitty floor mats are excellent, with these mats scoring really high in the ratings. The spikes on the bottom of these rubber mats help to hold them firmly in place. A couple of customers felt that these floor mats tore too easily, and did not last as long as one would expect. But overall, most customers felt these were excellent floor mats. 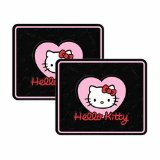 These Utility Sanrio Hello Kitty Heart floor mats are designed for the back seat floor area of your vehicle, and would be the perfect match for the Officially Licensed Hello Kitty Floor Mats, as the heart themes are the same. Kitty’s face appears framed in a large pink heart on a black background. These floor mats are designed for the rear of the vehicle only. These are cute floor mats, featuring the sweet face of Hello Kitty. 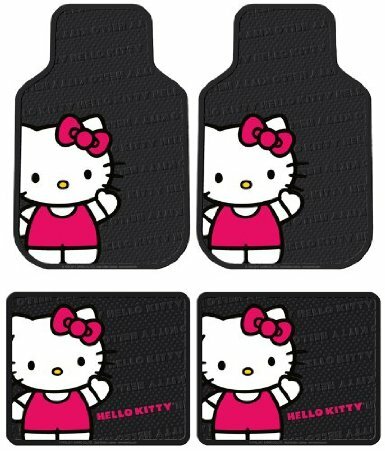 As they are designed for the rear of the vehicle, these mats would be a perfect match for both Hello Kitty front floor mats or floor mats that are plain black for the front of the car. While these floor mats do receive maximum star ratings on Amazon.com, this rating is based on only a small number of reviews. However, since other Hello Kitty floor mats by Plasticolor receive high ratings from a number of customers, there is no reason not to expect these floor mats to be just as durable and well loved. The interactive table of floor mats below, combined with the above reviews, will help you to decide which of the Hello Kitty floor mats is right for you. Now that you have seen some of the best floor mats for vehicles, and had a chance to read the detailed reviews on 3 of the best Hello Kitty floor mats, it’s up to you to pick the set of floor mats that best suits your needs, are in your price range, and suits your car, truck or SUV. The above comparison table will be updated to reflect any changes in the floor mats offered. If you feel we might have missed a superior set of floor mats that you think should be included, please let me know in the comments below.